I love Spirulina! (giveaway closed) was posted on January 9th, 2013 and is filed under Giveaway, Weight Loss. This entry has 74 comments. You can follow any responses through the RSS 2.0 Comment Feed. awesome benefits…and now I’m a lifelong spirulina addict. Once I started taking it several months ago, I haven’t had as much as a cold, my immunity is definitely stronger. I’ve noticed an increase in energy. My body is more balanced and even my skin is better (spirulina is nature’s beauty vitamin!). I just feel better. Plus, call me crazy, but I also just love the colour…the deep, rich aqua shade of green…it makes such a pretty smoothie. 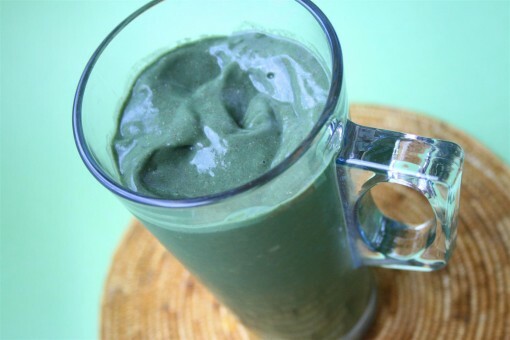 I often add spinach to my smoothie too and then they become even greener…what can I say? I like green. Because I’m obviously obsessed with this superfood, I was talking to the good folks at Nutrex Hawaii the other day where we finalized me becoming their first ambassador! I’m so excited because I’m passionate about spirulina and I’m glad this will allow me to share it more with people. Note: At any time, you can check my new Favourites Things page to find where I get my spirulina. However, this deal only lasts till the end of January. This giveaway is open to US and Canada and will require a street address. It will end on January 20th. Good luck and go eat some spirulina! Well you convinced me to try Truenutrition, I may have to give this a try! Thanks for the 25% off code. (though I wouldn’t mind winning some to try before I buy, lol). Have you tried the astaxanthin? From visiting Nutrex’s site I have learned that their company is entirely environmentally friendly, which is something I can get on board with! Following Super Nutrients on Twitter. I like that there is Vitamin K2 in it. I have been meaning to try Spirulina for so long! Considering how highly I regard your opinion, this is JUST the push I need! I had no idea that it was so easy to swallow–must admit that held me back. I was worried it would just taste… yucky! I’m an email subscriber! Love your site! I need something for more energy and this sounds promising. I subscribe to your emails. I have heard of spirulina but didn’t know what it was for. Thank you for the information! I would lovee to try it, I need to have some energy and protection from all these bugs going around!! I will definitely look into their products, but would love to win these to give them a good try!! I went to their site and learned it is also good for your brain and eye health! They have a very interesting site!! I subscribe to your blog and love it!! Thank you for such good information! Would really love to win these products after reading all the health benefits!! This is the only brand of spirulina my husband will use. After reading all the benefits, I think I need to get on board too and start taking it. I didn’t realize it was so high in protein! I learned that it’s soy and lactose free! I should have known spirulina was your fave. I love it, too. I haven’t tried that brand yet. Just followed them on Twitter. I am subscribed to your emails- I enjoy them and am going to try some Spirulina. It sounds very promising. I follow your site by email! Love your blog! I visited the Nutrex site and learned that Spirulina has 5500% more iron than spinach!!!! Holy molys that’s a lot of iron. I could definitely benefit from that! Oh how fun! I was just reading about spirulina earlier today (I won’t say the competitors brand.. hehe). I am already subscribed! I can’t enter as I’m in Ireland! But I did just buy Spirulina for the first time in powder form and now I’m putting off trying it for fear that the flavour will put me off! Do you find you have to mask it much? Ever tried it in an instant bake or pancakes? I subscribed and read about how much protein this packs along with the benefits to the whole body, but helping to prevent Type II diabetes and eye health – it truly is an amazing product. It’s very high in iron – which is something I need right now during my pregnancy! Shel (PeachyPalate) – I don’t mind the taste at all, so I don’t try too hard to mask it…but for people who don’t like it they should try the tablets…or else hide it in a smoothie. If you like sushi (the paper), you won’t mind this at all. I have tried it in protein pancakes and I really liked it that way! i also went to the website and learned that it is vegan/vegetarian, no gmos, and LACTOSE FREE! which is great because i am!! :) ive had spirulina at some smoothie places but i havent bought it for myself, until now hopefully!! As a lover of sushi, I’m glad to hear you compare the spirulina to the sushi paper (yum!). I learned that each bottle has a 2 month supply and there are no gmo’s or gluten! Perfect for me! I subscribe via email. Thanks for the giveaway! Always wanted to try Spirulina!!! I subscribe via email and twitter. Thanks for the giveaway! From the Nutrex site I learned that spirulina is good for eye health. I’m going to start taking it regularly as I have glaucoma (and will talk to my ophthalmologist about it next time I see him). 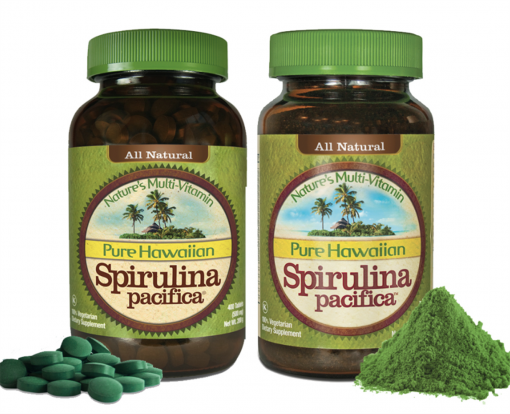 I learned that evidence shows that Hawaiian Spirulina Pacifica will support cardiovascular, eye and brain health, boost immunity, boost energy levels, support healthy skin and combat age related macular degeneration. All good things! I tweeted :) and I really would love to win. Thanks for the chance!! I am now a very happy subscriber! I’m so happy I found your site! I am a big fan of spirulina. I feel better when I take it. But I had never heard of Astaxanthin until I perused the site from here. My family really enjoys being outside and the “sunscreen like” factors for your energy are really interesting to me. I take this in powder form every morning in my lemon water. I did this intially to disquise the taste a bit, but now its just habit so I stick with it. It and chlorella are one of the best supplements to take to clean the blood thus boosting the immune system. No home should go without it. Ajali – I like the way you take it…I’ll have to try that! Thanks for sharing!